Traceview is a graphical viewer for execution logs that you create by using the Debug class to log tracing information in your code. 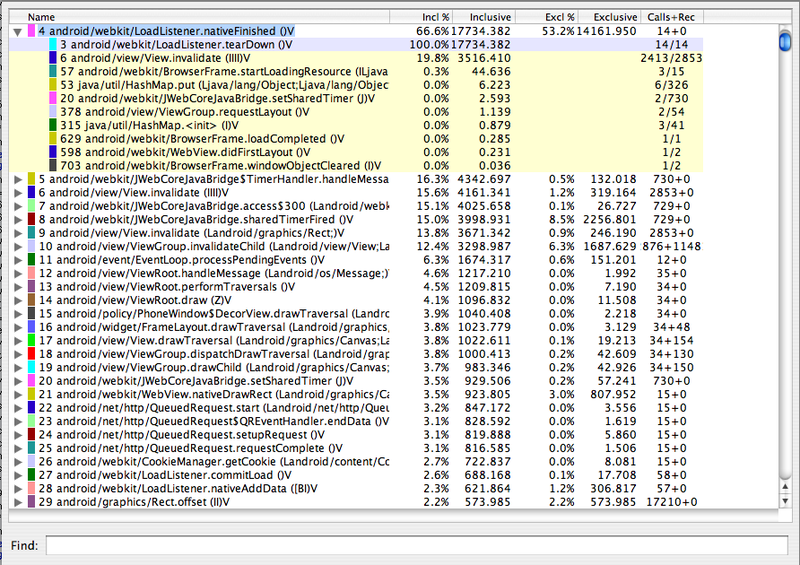 Traceview can help you debug your application and profile its performance. Figure 1 shows a close up of the timeline panel. Each thread’s execution is shown in its own row, with time increasing to the right. Each method is shown in another color (colors are reused in a round-robin fashion starting with the methods that have the most inclusive time). The thin lines underneath the first row show the extent (entry to exit) of all the calls to the selected method. Figure 2 shows the profile pane, a summary of all the time spent in a method. The table shows both the inclusive and exclusive times (as well as the percentage of the total time). Exclusive time is the time spent in the method. Inclusive time is the time spent in the method plus the time spent in any called functions. We refer to calling methods as "parents" and called methods as "children." When a method is selected (by clicking on it), it expands to show the parents and children. Parents are shown with a purple background and children with a yellow background. The last column in the table shows the number of calls to this method plus the number of recursive calls. The last column shows the number of calls out of the total number of calls made to that method. In this view, we can see that there were 14 calls to LoadListener.nativeFinished(); looking at the timeline panel shows that one of those calls took an unusually long time. To use Traceview, you need to generate log files containing the trace information you want to analyze. Include the Debug class in your code and call its methods such as startMethodTracing() and stopMethodTracing(), to start and stop logging of trace information to disk. This option is very precise because you can specify exactly where to start and stop logging trace data in your code. Use the method profiling feature of DDMS to generate trace logs. This option is less precise because you do not modify code, but rather specify when to start and stop logging with DDMS. Although you have less control on exactly where logging starts and stops, this option is useful if you don't have access to the application's code, or if you do not need precise log timing. If you are using the Debug class, your application must have permission to write to external storage (WRITE_EXTERNAL_STORAGE). Android 2.1 and earlier devices must have an SD card present and your application must have permission to write to the SD card. Android 2.2 and later devices do not need an SD card. The trace log files are streamed directly to your development machine. This document focuses on using the Debug class to generate trace data. For more information on using DDMS to generate trace data, see Using the Dalvik Debug Monitor Server. To create the trace files, include the Debug class and call one of the startMethodTracing() methods. In the call, you specify a base name for the trace files that the system generates. To stop tracing, call stopMethodTracing(). These methods start and stop method tracing across the entire virtual machine. For example, you could call startMethodTracing() in your activity's onCreate() method, and call stopMethodTracing() in that activity's onDestroy() method. When your application calls startMethodTracing(), the system creates a file called <trace-base-name>.trace. This contains the binary method trace data and a mapping table with thread and method names. The system then begins buffering the generated trace data, until your application calls stopMethodTracing(), at which time it writes the buffered data to the output file. If the system reaches the maximum buffer size before you call stopMethodTracing(), the system stops tracing and sends a notification to the console. Interpreted code runs more slowly when profiling is enabled. Don't try to generate absolute timings from the profiler results (such as, "function X takes 2.5 seconds to run"). The times are only useful in relation to other profile output, so you can see if changes have made the code faster or slower relative to a previous profiling run. 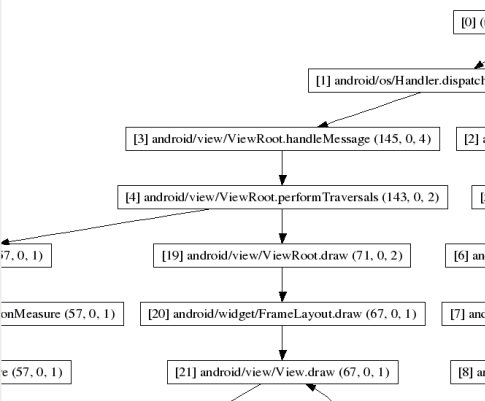 In Android 4.4 and later, you can use sample-based profiling to profile with less runtime performance impact. To enable sample profiling, call startMethodTracingSampling() with a specified sampling interval. The system will then gather samples periodically until tracing is stopped via stopMethodTracing(). Start the Android Device Monitor. In the Android Device Monitor tool bar, click DDMS and select a process. Click the Start Method Profiling icon to start method profiling. After the profiling is complete, click the Stop Method Profiling icon to display the traceview. dmtracedump is a tool that gives you an alternate way of generating graphical call-stack diagrams from trace log files. The tool uses the Graphviz Dot utility to create the graphical output, so you need to install Graphviz before running dmtracedump. The dmtracedump tool generates the call stack data as a tree diagram, with each call represented as a node. It shows call flow (from parent node to child nodes) using arrows. The diagram below shows an example of dmtracedump output. The tool then loads trace log data from <trace-base-name>.data and <trace-base-name>.key. The table below lists the options for dmtracedump. -t <percent> Minimum threshold for including child nodes in the graph (child's inclusive time as a percentage of parent inclusive time). If this option is not used, the default threshold is 20%.